Dragon’s Domain Records, to be distributed through buysoundtrax.com, presents the world premiere soundtrack release of THE BELSTONE FOX, featuring music composed by Laurie Johnson (FIRST MEN IN THE MOON, THE AVENGERS, CAPTAIN KRONOS) for the 1973 drama directed by James Hill (A STUDY IN TERROR, BORN FREE, BLACK BEAUTY), based on the novel by David Rook and starring Eric Porter, Jeremy Kemp, Bill Travers, Rachel Roberts, Heather Wright and Dennis Waterman. Based on the 1970 novel, THE BALLAD OF THE BELSTONE FOX, by author David Rook, the 1973 British film was directed by James Hill, best known for directing BORN FREE in 1965, who had a special affinity for animal stories. THE BELSTONE FOX tells the story of a young fox who survives the killing of its siblings at the hands of fox-hating hunters. The fox pup is adopted by Asher Smith (Porter), a huntsman working for a local landowner who hosts regular fox hunts on his land. Asher allows the fox to be raised in captivity with a litter of hound pups and as time passes, Asher and his daughter, Jenny (Wright), grow fond of the crafty canine. The fox, which they name Tag, forms a bond with one of the young pups, named Merlin and they eventually become inseparable. This relationship leads to complications when the time comes for Merlin to join the hunting pack and Tag must be sent out on his own. Tag is able to avoid becoming the target of the ritual fox hunts, often with Merlin’s help, much to the irritation of the local landowner, Mr. Kendrick (Kemp). When one hunt ends tragically as a result of Tag leading the hounds into the path of an oncoming train, Asher resolves that Tag must be put down. To provide a musical score for the film, the producers turned to respected British composer Laurie Johnson. He was hired onto the project by executive producer Julian Wintle who, along with James Hill and Johnson were all veterans of the cult television classic THE AVENGERS. Johnson’s score is largely centered on a single, primary theme, favoring the oboe accompanied by light strings, which is used throughout the score in a diversity of arrangements. The theme is a grand and luxurious melody, instantly memorable, nicely opened up from its initial solo oboe performance into a choir of violins augmented by elegant horn phrases. One of the highlights of the score is The Belstone Hunt, a lengthy six minute plus cue where the composer gives the orchestra a full workout as they perform the exciting, aggressive and ultimately tragic music for the hunt. 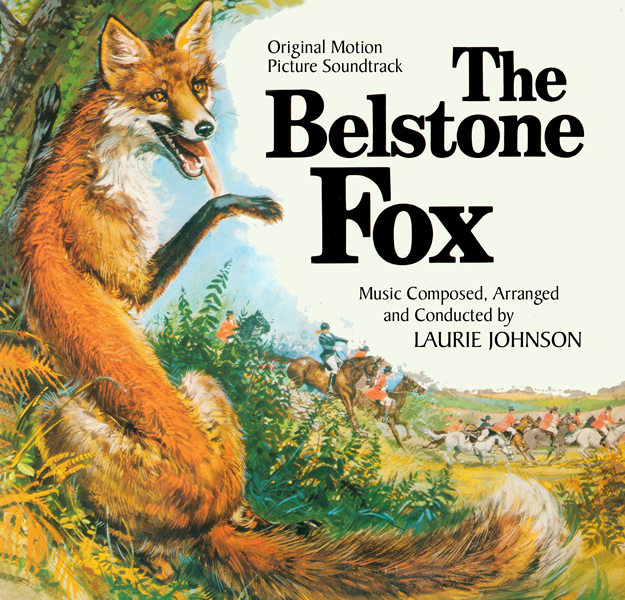 Johnson’s warm, adventurous music for THE BELSTONE FOX, while containing its share of dramatic and dangerous action/suspense scoring, remains a distinguished effort amidst a filmography favoring action-oriented series and films. Born in Hampstead, London, in 1927, Laurie Johnson undertook his musical studies at the Royal College of Music, where he would later return as a professor. He embarked on a professional musical career at the age of 21, composing and arranging for a variety of big bands. Johnson began scoring films and television in 1956, and soon proved to have an affinity for the quirky, the fantastic, and the horrific with his scores for Stanley Kubrick’s DR. STRANGELOVE (1963) and the Ray Harryhausen spfx drama, THE FIRST MEN IN THE MOON (1964) and Hammer Films’ CAPTAIN KRONOS VAMPIRE HUNTER. Johnson is also well known for scoring the theme and most episodes of the iconic British television show THE AVENGERS (1961-69) as well as its revitalized series THE NEW AVENGERS (1976-77) and another spy-series, THE PROFESSIONALS (1977-1983). He would also work closely with his friend and mentor Bernard Herrmann, adapting, orchestrating and conducting Herrmann’s music from the 1974 Larry Cohen horror film IT’S ALIVE into its two sequels, released after Herrmann’s death. In 2014, Johnson was honored by being appointed Member of the Order of the British Empire (MBE) for his services to music. The only release of the soundtrack album for THE BELSTONE FOX was a gatefold vinyl album from Ronco in England in 1973. Surprisingly, its engaging main theme was vacant from any of the many compilations of Johnson’s music until 2009, on a 2CD set now well out of print. Dragon’s Domain Records is excited to celebrate Laurie Johnson’s film score with this world premiere compact disc release of the original soundtrack album, remastered from the best elements available by James Nelson at Digital Outland. The booklet includes liner notes written by author Randall Larson. THE BELSTONE FOX is a limited edition release of 1000 units. THE BELSTONE FOX will begin shipping on the week of April 6th, 2015 and can be ordered at www.buysoundtrax.com.